Major: Ph.D. in Public Health at Robert Stempel College of Public Health and Social Work. Where did you intern? I interned at The United Nations Office of the High Commissioner for Human Rights (OHCHR), Universal Periodic Review (UPR) Branch. This internship was a part of a fellowship from Duke University. How did you get your internship? I applied for the summer 2018 Duke Global Policy Fellowship Program in Geneva and was selected as a Humanitarian Action: Human Rights, Refugees, and Crisis Response fellow. The fellowship is composed of an internship and a five-day intensive course. 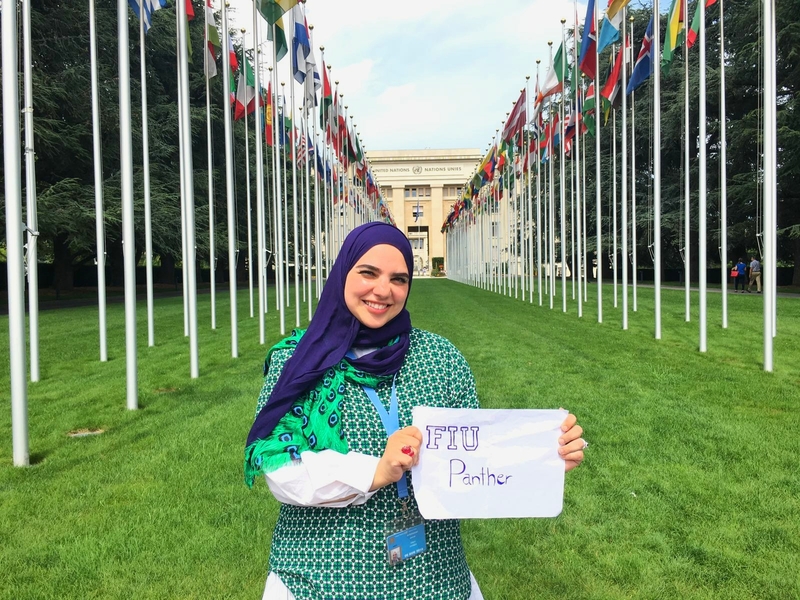 Applying for internships and securing an internship post is the student’s responsibility; however, the program includes career services support to help you find an internship, and that is how I found mine in the OHCHR. What did you do there? What projects did you work on? I joined the UPR at a very critical time: on the first day of UPR’s 30th Working Group session. The UPR is a unique process which involves a review of the human rights records of all UN Member States. I assisted staff members in country reviews; collected and analyzed written material and oral statements; assisted in translating statements; assisted in the drafting of small sections of the Working Group report under supervision; took care of statistical figures; and helped in podium management. In the intensive course week, I had two main assignments. The first was a case study role play, where prominent scholars and humanitarian experts in the field have disagreed with each other on the concept of “doing no harm,” neutrality and impartiality principles and their implications in life. I was assigned to take Gerald Martone’s position with other team-members in a debate. Martone is the author of “Relentless Humanitarianism,” who believes that the international humanitarian community should not cease to aid a population in need in the name of moral principles, even if that aid is causing harm. This assignment on the first day of the course was a very good introduction to understand the different schools in the humanitarian actions field. The second was a simulation-case contest where together with my team members we were asked to develop health policy for a Syrian refugee camp in Lebanon. In the scenario that Lebanon can no longer integrate the high number refugees pouring across its borders, we needed to create a plan for new camp structure. As one team of four competing, we presented our plan to the ministry represented by a panel of judges. I was responsible for deciding what are the priority health conditions that we should address. What was the coolest thing about your internship or that happened during your internship? There were a lot of cool moments, including when my team won the contest of designing the health policy! What was unique about our project was the branding. We selected a name for our camp which was “Sa7a with Dignity” and created a logo for it that was on each slide. “Sa7a” in Arabic means “health” and the “7” is the way Arabs write the sound of the letter that is missing in English alphabet, and also it represented the 7 core issues we made our plan revolve around. Dignity is the concept we drew from the “SPHERE” project, which is the standards of humanitarian work, and it represented that we did everything to preserve the dignity of the refugees, and not just to rescue them. What advice do you have for those beginning the internship process? To be persistent and patient. The application process is lengthy and exhausting, and among all other responsibilities you have during the semester, you can easily become overwhelmed and decide to give up. What did you like most about your experience? There were many things that I have reflected on after I have finished this program. But one of them was my ethical interpretation of some humanitarian principles. Thinking about ethical decisions in the profession began with the “Ethical Issues in Public Health” course that I took with Dr. William Darrow in last spring as a required course of the Public Health Ph.D. program. Over the week, I listened to the guests’ different views, and by the end of the week I found myself, and I understood my possible position, but most importantly I realized the importance of having those different views and the ecosystem of the humanitarian aid. I reached a conclusion that I do not condemn other organizations if they accepted an offer and made the best of it. Even if their position contradicted my beliefs, maybe they can indeed benefit the community through this collaboration. What did you learn about yourself? I met lovely people and some challenging personalities with big egos or discriminatory attitude as well, and I was pleased that I was mindful of my emotions and reactions and reflected on them frequently. So, I learned that I could control my reactions better when I become very aware of the stimulants around me. Also, in some assignments there were times where some male members were dominant. I was trying to explain my view, when I respectfully disagree, but as a female, I usually feel guilty to disagree when nobody else does, and I even apologize to avoid looking like a troublemaker. However, after an incident, different female colleagues approached me separately appreciating that I expressed my opinions when they could not and said that many times they had the same point of view but were too reluctant to express. This experience made me more aware of the gender differences in teamwork and encouraged me to speak up when I think I should, not just for my own sake, but also for other women out there. How did the position increase your professional confidence? I came out of it looking forward to working in the field before going to headquarters; planning to work for a humanitarian NGOs for health issues for some time, encouraging my fellows in public health programs who are interested in humanitarian work to apply for the fellowship, establishing a humanitarian action program back home, and teaching my daughter the love of humanitarian work and human rights.